The Neanderthals were our cousins that went extinct ~30,000 years ago. We were so similar that we interbred, and so some people argue that we’re actually sub-species rather than different species. Regardless, our families still split at some point, which genetic analysis shows happened between 300 – 600,000 years ago. But who was the last common ancestor of humans and Neanderthals? Conventional wisdom holds that it was Homo heidelbergensis1,2, a species that lived in Europe and Africa from 900,000 to 300,000 years ago. It was both in the right time and place to be the last common ancestor (LCA) of us (who evolved in Africa) and Neanderthals (who evolved in Europe). H. heidelbergensis also shares many similarities with humans and Neanderthals, such as large brains, a prominent browridge (like a Neanderthal) and a higher forehead (en-route to becoming human)3. There are also many “transitional” fossils, with skulls from the Spanish site of Sima de los Huesos showing a heidelberg-like face gradually developing Neanderthal characteristics1. However and international team of researchers may have found evidence that contradicts the classic view of who Neanderthals and humans evolved from. They used a statistical model to predict what the teeth of the last common ancestor of humans and Neanderthals should be like, then compared that to as many fossil teeth as they could find. Surprisingly, none of the fossils matched their prediction. Not even Homo heidelbergensis had the teeth that the last common ancestor should have; casting doubts over whether it really was the species that gave rise to humans and Neanderthals4. The model they used to predict what they teeth should be like changed depending on which teeth they based it on and how these teeth were related to each other. So they repeated the experiment 12 times using different teeth and different relationships, checking each time to see if Homo heidelbergensis matched the prediction. The predictions for what the teeth on the lower jaw should be like matched H. heidelbergensis in over half of these experiments, but the predictions for the top teeth rarely matched. In fact, for some of the top teeth the H. heidelbergensis never matched the predictions4. 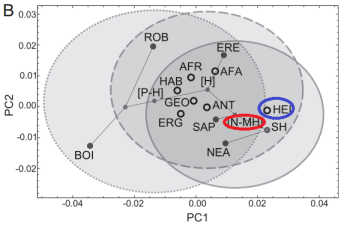 A comparison of the various teeth (heidlebergensis circled in blue) with the predictions of this study (circled in red). 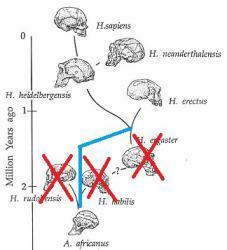 Heidelbergensis does not match the prediction! On a more positive note, they also used this method to investigate which species was the last common ancestor of later Homo (such as Neanderthals, heidelbergensis, humans etc.) and found Homo ergaster Homo erectus to be a strong match. They also discovered Australopithecus afarensis (Lucy’s species) and Au. africanus were the likely common ancestors of Homo and Paranthropus (a weird branch of the human family I like to refer to as “human cows“)4. Many scientists already suspected that these were how various species were related3, so its nice to see not all of our ideas should be thrown out because of this study. But should we even remove Homo heidelbergensis as the last common ancestor of humans and Neanderthals? There’s nothing wrong with the experiment, but there is a question over whether or not teeth were the right part of the anatomy to examine. Ultimately they used them because teeth are tough and preserve well, so we have a more complete record of them than for any other part of our family’s body. However, teeth are also one of the most variable part of the human body and can be very different from person to person5. Even how teeth grow and develop can be significantly different between populations6! We also have to remember that we’re looking at just one aspect of anatomy here, which makes it less reliable than if the entire body was examined. There are many case of researchers thinking they’ve found something in one bone, only to have it disappear when they examine a larger sample. Because of this I don’t think we should dismiss Homo heidelbergensis as the last common ancestor of humans and Neanderthals just yet. The balance of evidence from the whole body still indicates they were the parent species of our lineages. Nonetheless, this study into their teeth raises eyebrows and we should remember that nothing in science is properly certain. A time may come when Homo heidelbergensis is relegated from its position as last common ancestor, but it is not today. Stringer, C. (2012). The status of Homo heidelbergensis (Schoetensack 1908).Evolutionary Anthropology: Issues, News, and Reviews, 21(3), 101-107. Although as with anything in palaeoanthropology “conventional wisdom” hardly means a universal consensus and many still argue over where Homo heidelbergensis fits into the picture. Gómez-Robles, A., de Castro, J. M. B., Arsuaga, J. L., Carbonell, E., & Polly, P. D. (2013). No known hominin species matches the expected dental morphology of the last common ancestor of Neanderthals and modern humans.Proceedings of the National Academy of Sciences, 201302653. Scott, G. R., & Turner, C. G. (2000). The anthropology of modern human teeth: dental morphology and its variation in recent human populations (Vol. 20). Cambridge University Press. Tompkins, R. L. (1996). Human population variability in relative dental development. American journal of physical anthropology, 99(1), 79-102.